Super PACs and other outside groups spent more than $2.6 million in North Carolina's 2014 primaries, according to data compiled at FollowNCMoney.org. Super PACs and other outside groups injected more than $2.6 million worth of TV ads and other spending targeting state races before North Carolina's May 6 primaries, according to a Facing South/Institute for Southern Studies analysis of newly filed campaign finance reports. 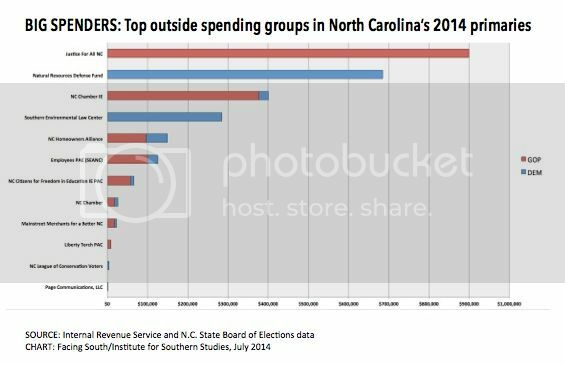 The volume of money spent during the North Carolina primaries points to the growing role of independent spending groups in state elections, including judicial races. In North Carolina this year, there will be seven statewide court elections for the N.C. Supreme Court and N.C. Court of Appeals. Nearly half of the state-level outside money spent before the North Carolina primaries -- nearly $1.3 million -- targeted just one of those races: the N.C. Supreme Court seat currently held by Robin Hudson, a registered Democrat who ended up coming in first in the three-way primary despite a spending onslaught targeting her. The data comes from the Institute's website FollowNCMoney.org, one of the only sites in the country to track outside election spending at the state level. Drawing on state and federal campaign finance reports, FollowNCMoney.org has found records of 107 expenditures totaling $2,676,018 in the 2014 races aimed at North Carolina legislative and court races. The N.C. Supreme Court race in which Hudson faced two conservative challengers, Eric Levinson and Jeanette Doran, was by far the biggest money magnet. The unprecedented level of outside spending in the judicial primary was driven by $899,000 worth of attack ads funded by Justice for All NC, a conservative super PAC-style group. Justice for All NC's widely criticized attack ads were made possible largely due to $900,000 in contributions from the Republican State Leadership Committee, which has invested heavily in backing GOP and conservative candidates in North Carolina state elections in recent years. N.C. Chamber IE, the outside spending arm of the conservative-leaning N.C. Chamber, spent $400,486 before the primaries, with $345,000 of that going towards ads that backed Levinson and Doran, the conservative candidates in the officially nonpartisan race. Cook and Rabin didn't have Republican challengers in the primary, so the spending couldn't affect the outcome. But because the ads -- which criticized Cook's vote for a "mega trash dump" and Rabin's support of fracking -- singled out the senators close to a primary in which Democrats were also running, the expenditures were classified as electioneering. * The N.C. Homeowners Alliance, largely backed by the N.C. Association of Realtors, spent $148,829 on state legislative races, the majority benefiting Republican candidates. * The Employees PAC of the State Employees Association of North Carolina spent $126,000, with $100,000 of that benefiting Republican state Senate candidate Michael Lavender. * N.C. Citizens for Freedom in Education IE PAC, a group backing candidates who support vouchers and other efforts benefiting private schools, pushed $65,932 into legislative races, 87 percent of that in support of Republicans. 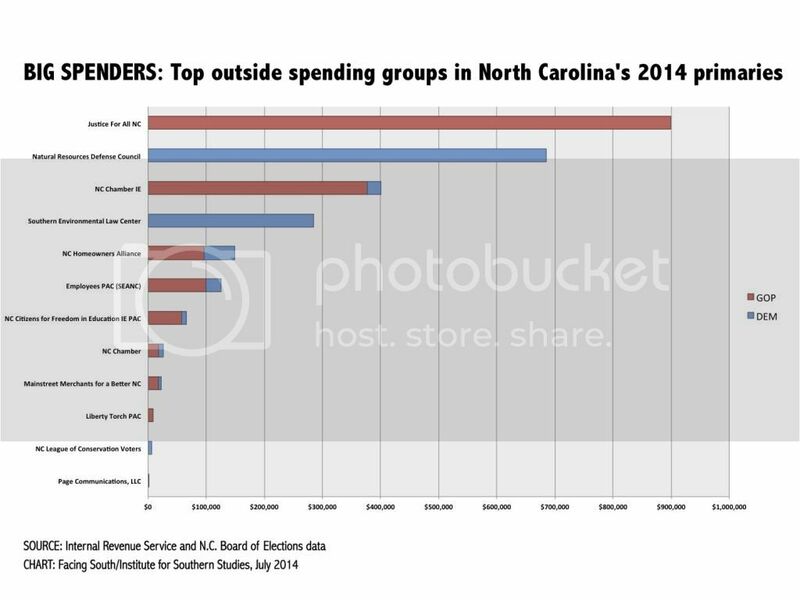 Since North Carolina's May primaries, money has kept flowing from outside groups. A Facing South/Institute analysis of second quarter filings with the N.C. State Board of Elections has found nearly $44,000 spent targeting state-level races since May 7, with three-quarters of that ($33,425) coming from the N.C. Citizens for Freedom in Education IE PAC. 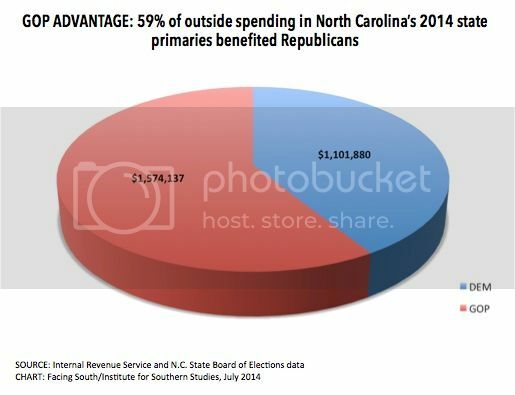 For more information about outside spending in North Carolina elections, visit FollowNCMoney.org. You can also follow the project's Twitter feed FollowNCMoney. * This paragraph was revised to specify which expenditures came from the N.C. League of Conservation Voters, Natural Resources Defense Council and Southern Environmental Law Center.